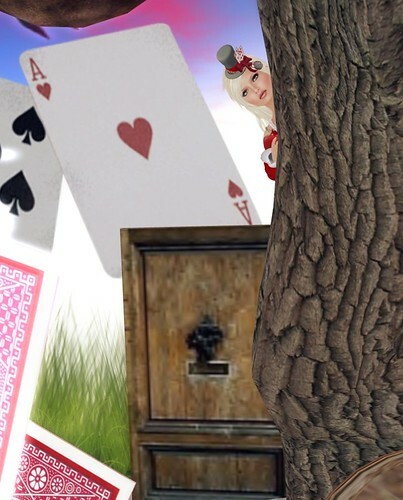 For Easter, I am dressing up as Alice trying to chase the elusive White Rabbit through a very tiny door. I *love* this Black Rabbit, White Rabbit outfit set from deviousMind! The outfit comes with so many different layers & props so you can create different looks. I am wearing the gorgeous Red Tuxedo Jacket, which matches perfectly with my new Friday ‘Dream Booties’ in Tomato. The pose prop I’m using is an old favorite from Kurotsubaki. A friend bought me this back in August 2008, so it’s quite old but still so awesome!! I love the built-in poses! Bravo !!! real success !